Aberystwyth is the culture capital of Wales. Home to The National Library, [below] University and the excellent Arts Centre[right] with its concert hall, cinema, large exhibition space, plus a great café and design shop. Ceredigion Museum housed in the delightful Edwardian Coliseum Music Hall has permanent displays focusing on agriculture seafaring and lead mining. Plus temporary exhibitions throughout the year. Being a University town, Aberystwyth is full of cafes, bars, eating places and a wide range of specialist shops. There are Market Halls at the top of Great Darkgate which expand into the street every Wednesday and Saturday, and a Farmers Market is held on the third Friday of the month - exact dates are on our events pages. Why not take a stroll along the Victorian promenade [left] to Constitution Hill. Ride the Cliff railway to the top then enjoy the fantastic views and refreshments in the café. Aberystwyth castle was partly destroyed on the orders of Cromwell after the New Model army defeated The Royalists in 1654. Stone from the castle was used for building in the town. Visit the castle ruins at the southern end of Aberystwyth for a dramatic view overlooking Cardigan Bay. Parking is easy and Aberystwyth Railway Station, in the middle of town, has a regular service from Birmingham. See the Travel section on this site for full details on how to get to Aberystwyth. Come and enjoy a feast of fine food! 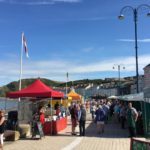 Food Festival held on Aberystwyth Promenade with all kinds of stalls and activities: cookery demonstrations and sample tasters by fish experts and local hotel chefs.